With Colin Trevorrow's Jurassic World arriving in theaters very soon, there are surely fans everywhere doing their own retrospectives of the entire Jurassic Park franchise. This includes the folks over at Cinema Sins, who have launched a brand new episode tearing apart Joe Johnston's Jurassic Park III. Watch it below! It was just yesterday that Cinema Sins launched their video tearing apart Steven Spielberg's The Lost World: Jurassic Park, but they've wasted no time putting together another episode of their "Everything Wrong With..." series taking down Jurassic Park III. And while neither movie truly lives up to the legacy of the original Jurassic Park, it's the third film in the franchise that has always received the greatest amount of flak. 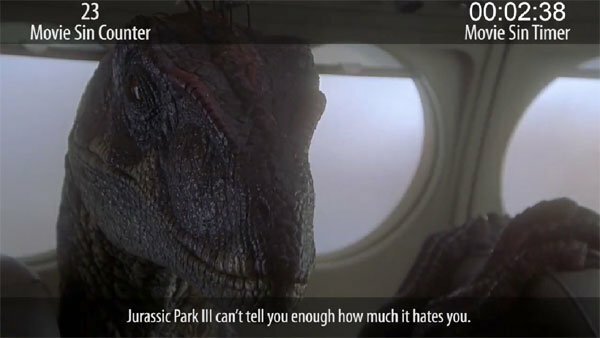 So what exactly is it that's wrong with Jurassic Park III? Well, as this video points out at numerous points through its 16+ minute runtime, a lot of it has to do with the design of the movie. The original Jurassic Park has aged incredibly well because Steven Spielberg pushed for a mix of special and visual effects, but it doesn't look like a similar effort was made on the set of Jurassic Park III. While it's not the worst CGI in the world, the dinosaurs in the movie certainly don't look as good as they once were portrayed. It also doesn't help things that the movie does some pretty dumb stuff at times, and is not exactly amazing when it comes to the the cast of characters it assembles (William H. Macy and Tea Leoni don't exactly make up for the lack of Jeff Goldblum's Ian Malcolm). And don't think that I'm not going to mention to stupid talking Velociraptor that Alan Grant dreams about. I get that it's foreshadowing the fact that he's able to communicate with the raptors later in the movie, but it comes across as just being silly. While the original Jurassic Park is a classic that will live-on for decades and decades, the sequels have not left the greatest legacy for the franchise. Of course, that may soon change. Jurassic World will be arriving in theaters next Friday, June 12th, and bringing all kinds of dinosaur mayhem to modern audiences. We re going to have full coverage of the movie both before and after its released, so be sure to stay tuned in the next few days/weeks for all sorts of Jurassic Park-related awesomeness.